That’s a directive Jeanette Gross has taken to heart, and repeats often, especially on Friday mornings. 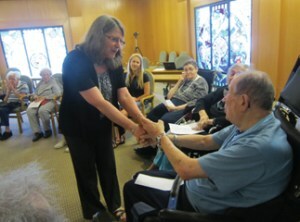 That’s when the Oakland resident convenes a sacred chant group at Reutlinger Community for Jewish Living in Danville, something she’s been doing for the past 11 years. Once a month, Gross comes to the Reutlinger synagogue, where she leads residents in an hour of chanting Hebrew phrases from the Torah or other Jewish sources, as a way to welcome Shabbat. Gross was introduced to Jewish chanting in the mid-’90s. Her husband went on a retreat led by Jewish Buddhist teacher Sylvia Boorstein and Rabbi Shefa Gold, who is known in the Jewish Renewal movement for her beautiful chanting. Even with two small children at home, Gross’ husband wanted his wife to experience what he did. And when she did, she was hooked. She attended Gold’s Kol Zimra leadership training program in New Mexico, and now is a trained chant leader. Though Jewish Renewal congregations have long been incorporating chant into their services, Gross belongs to Lafayette’s Temple Isaiah, which is Reform. “I didn’t know of any chanting groups, and I was wanting a chanting community,” she said. She began such a group at Isaiah in 1997, and after Reutlinger opened in 2000, Gross was asked to come chant with the residents as a one-time gig. Each time, the group is a mix of regulars and newcomers. Gross passes out a sheet of paper with that day’s chants on it, so everyone can follow along. Some chant with her, some just listen and some doze off. And sometimes, residents speak up about what a certain verse or prayer means to them; others ask questions. Geraldine Gluckman, who is 104, has been coming to the monthly chanting sessions since the beginning. She says the chanting gives her a “relaxing feeling,” a nice way to bring in Shabbat. Gross spends the hour moving from prayers expressing gratitude and thanks to God, to those for healing. After each chant ends, the group sits in silence for a few minutes, to meditate or reflect on the words that were sung. One chant incorporated arm movements, which some of the residents performed, waving their arms above their heads as they sang. At the end of their time together, Gross got up and made eye contact with each resident, as the group sang “Shabbat Shalom” together. This can often be the most meaningful time for her, she said; even if the seniors have been dozing during the chanting, at this moment, they are very much awake. Ellen Schaefer, a member of the activities staff at Reutlinger, said the chanting circle brings something unique to the residents. “It’s a chance to get away from the everyday worries and chatter that goes on in their minds,” she said. “Over time the class has become larger, with many more residents participating now.